A co-branded book project with Jisc (formerly the Joint Information Systems Commitee), off the back of DigiFest 2014, a digital festival run by Jisc for the first time in 2014. The aim of the book is to bring cutting-edge discussion as heard at DigiFest to the information professional/academic librarian readership. 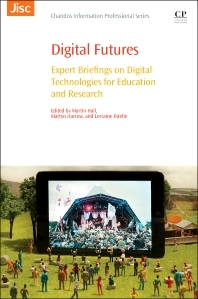 Digital Futures will provide expert briefings to information professionals on the emerging trends in the digital technologies that are transforming teaching and research in higher education. 4.2 Where Is Further and Higher Education? 5.2 Who Owns the Technology? 5.3 How Is Technology Enhancing the Curriculum? 5.4 How Is Technology Enhancing Assessment? 5.5 How Are Students Engaged in Developing the Digital Student Experience? 5.6 What Are the Challenges Facing Institutions? Professor Martin Hall is Chair of Jisc, and Vice Chancellor of the University of Salford, UK. A British-South African academic and educationalist he has written extensively on South African history, culture and higher education policy. Professor Hall was a member of the Working Group on the Finch Committee which examined Open Access policy in the UK. Professor Martyn Harrow has extensive strategic experience in both public and private sectors. Before taking up his position as head of Jisc in February 2012, he was director of information services at Cardiff University where he was responsible for IT and also the university’s library service, media centre and high performance computing. Previously Martyn led ICT for global companies within Unilever and ICI. At various times he was responsible for IT across the USA, Europe, Africa, the Middle East and Asia while based in the UK and the Netherlands. He also has experience in local government, having held a senior role at Avon County Council. Lorraine Estelle has been Chief Executive of Jisc Collections since 2006. She has overseen the organisation's growth and development and has been heavily involved in all aspects of national procurement and licensing activities for academic libraries., She has initiating a range of fruitful projects and services around the use, management and delivery of digital resources. .Since May 2013, Lorraine has also taken the leadership role for all Jisc’s digital content and discovery related people, organisations, strategy, services and operations. Lorraine is also co-editor of Insights: the UKSG journal.